"I fear all we have done is awaken a sleeping giant and fill him with a terrible resolve." Japanese Admiral Isoroku Yamamoto, upon learning of the success of the attack on Pearl Harbor. The Story of Irwin "Willie" Wilson, U.S. Navy Veteran WWII & Larkspur Fire Department Paid Fireman/Engineer, 1918-2003. Willie served on the U.S.S. Louisville throughout WW II as a Gunner's Mate. The photo above shows the ship anchored off Mare Island Naval Shipyard, just to the east of Marin County. The ship and crew fought in numerous large sea battles, earning thirteen Battle Stars for their service. The short US Navy video below shows the ship being attacked by two kamikazes in a terrible battle late in the war where 43 men were killed. As the US Navy began the bombardment of Luzon in preparation for the invasion of the Philippines in January of 1945, the goal was to 'soften up’ Japanese defences prior to amphibious assault. During this major battle, the U.S.S. Louisville and many other ships were attacked by Japanese suicide ‘Kamikaze’ planes. With Japanese airbases within easy reach and the use of Kamikaze pilots now one of their main tactics, the US ships had to face an unprecedented assault, with many ships being hit more than once. The USS Louisville had been hit on the January 5th, with one man killed and 52 wounded, including the captain. The following day she was attacked by six more planes, five were shot down but one got through, and 42 more men were killed, including an Admiral. See the video below, click the symbol just before the word vimeo in the lower right to see full screen. "All of a sudden, the ship shuddered and I knew we were hit again. I was in charge of the 1st Division men and I yelled 'We’re hit, let’s go men!' I was the first man out the Turret door followed by Lt. Commander Foster and Lt. Hastin, our Division Officer, then a dozen more men. The starboard side of the ship was on fire from the focsle deck down. One almost naked body was laying about ten feet from the turret with the top of his head missing. It was the Kamikaze pilot that had hit us. He made a direct hit on the Communications deck. As the men poured out of the turret behind me they just stood there in shock. Explosions were still coming from the ammunition lockers at the scene of the crash. We could see fire there too. Injured men were screaming for help on the Communications Deck above us. I ordered two men to put out the fire on the starboard side by leaning over the side with a hose. That fire was coming from a ruptured aviation fuel pipe that runs the full length of the forecastle on the outside of the ship’s hull. That fuel pipe was probably hit by machine gun bullets from the Kamikaze just before he slammed into us. Although there was no easy access to the deck above us, I ordered several men to scale up the side of the bulkhead (wall) and aid the badly burned victims who were standing there like zombies. I also ordered three men to crawl under the rear of Turret 1’s overhang, open the hatch there, and get the additional fire hose from Officers Quarters. These three orders were given only seconds apart and everyone responded immediately, but when they got near the dead Jap’s body, which was lying right in the way, it slowed them down. The strike on the Louisville was also notable for the death of Rear Admiral Theodore E. Chandler, commanding the battleships and cruisers in the Lingayen Gulf. He was badly burned when his Flag bridge was engulfed in flame – but later waited in line for treatment with the other men. However his lungs had been scorched by the petroleum flash and he died the following day. Willie left home at age thirteen to join the "C''s (seas) and later joined the U.S. Navy. He was stationed aboard the Light Cruiser USS Louisville, a ship that was modified at Mare Island Naval Shipyard and later reclassified as a Heavy Cruiser. He trained to be a gunner's mate, and served on the ship throughout World War II. The ship and her crew earned thirteen battle stars, and late in the war were hit by two kamikaze planes, killing 43 men including an Admiral. Read all about the ship by clicking on the "Learn More" button above. After the war Willie transferred to Naval Transport Duty, and left the Navy in the early 1950's. 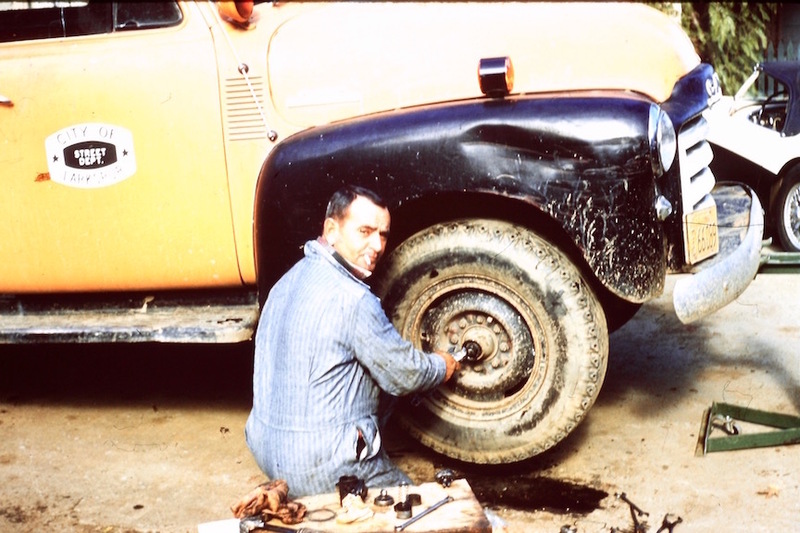 Willie worked in construction at Hamilton Village in Ignacio, then as a handyman and busboy at Rancho Nicasio, where he met Faye, his loving wife of 50 years. They moved to Larkspur where he worked for the Public Works Department, until joining the Larkspur Fire Department as one of the first full-time paid firefighters. Sadly, at the end of his career he was driving Larkspur Engine 1 to a reported structure fire in Greenbrae at a convalescent hospital when the engine crashed enroute, killing volunteer fireman Jim Niven. His earlier naval service may have been a contributing factor - he had lost much of his hearing in the various naval battles while serving as a gunner's mate. He was known to get the motor up to higher rpm's to be able to hear enough to properly shift the manual 12-speed transmission. This may have contributed to the excessive speed cited by the CHP as a contributing factor in the accident. See the line of duty deaths section and the 1978 page entry for Jim Niven to learn more about the accident. Willie took great pride in being a firefighter, as well as the fellowship of his co-workers. He retired in 1978, but remained active by painting and gardening. Willie was loved and respected by all who knew him. He touched many lives and will be greatly missed. He was survived in 2003 by his wife, Faye Wilson; stepchildren Fran (Jerry) Otani, Pete (Becky) Cacioppo; grandchildren Cindi, Tony, Greg, Beth, Cathy, Pam, Carey, Sherri; and great grandchildren Nick, Fallon, Raymond, James, Nicole, Alyssa; brothers and sisters Bernice Quandt, Lorraine (Henry) Hesselgrave, Don (Kay) Wilson, Rolland (Donna) Wilson, Jack Byrne, Ada Wilson, Mary Ann Wilson. He was predeceased by his parents Arthur and Katherine Wilson, brothers and sisters Florence Byrne, Clarence Wilson, Wid Wilson and Shirley Wilson. 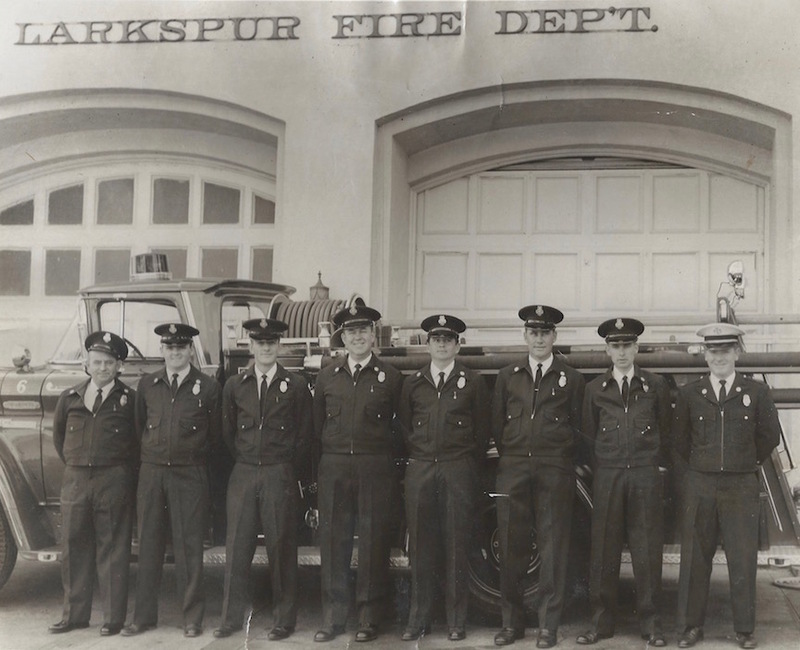 Willie is pictured on the far left is this group photo of the Larkspur FD paid firemen taken in the early 1960's in front of the main station in downtown Larkspur, and Squad 6. Irwin 'Willie' Wilson, William 'Bill' Lellis, Craig Shurtz, Arthur 'Bud' Wedemeyer, Gordon 'Gordy' Bell, Clive Coverdale, Ranger Benz, Chief George Bartram. 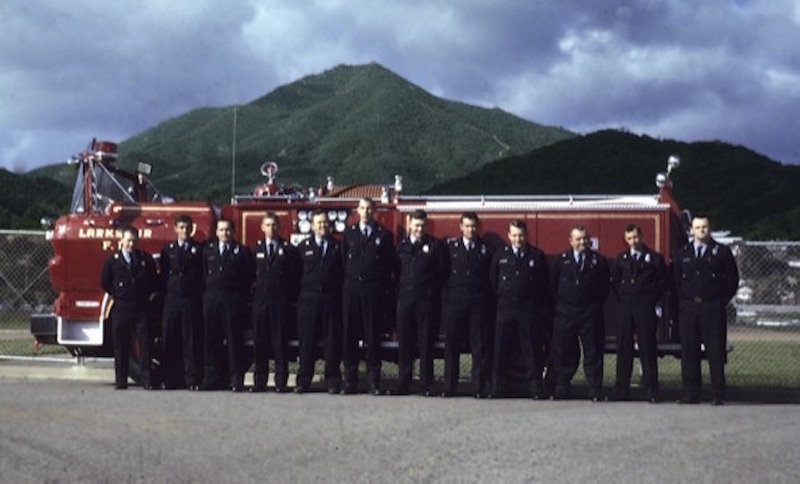 Willie is pictured third from the right in this 1966 photo of the Larkspur FD paid staff. Wiliie worked for the City of Larkspur Street Department in the early 1950's before transferring to the Fire Department. It was later called Public Works.